Miranda Legg got her classmates involved and collected thousands of beauty product empties to win a nationwide recycling competition. 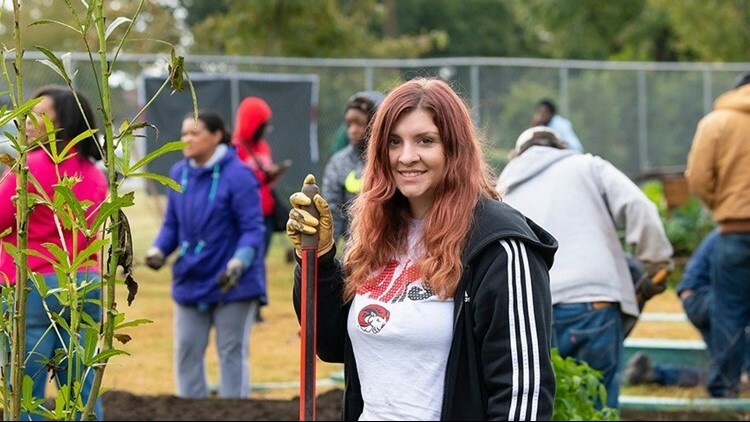 WINSTON-SALEM, N.C. -- Winston-Salem State University is getting a $30,000 community garden thanks to a fellow classmate who is passionate about recycling. Miranda Legg is a senior psychology major and Spanish minor at WSSU. In April, she combined her passions to help her university win a nationwide recycling competition. Miranda sent emails to fellow students. She also set up recycling boxes in Foundation Heights, where she lives and works as a resident assistant. By the end of the competition, she'd collected 5,000 beauty and personal care containers, topping college competitors on 50 campuses to win Garnier's Rinse, Recycle, Repeat: College Competition. For leading her school along the way, Miranda received a $2,000 scholarship. She also helped win her campus a $30,000 Garnier Green Garden. The donation includes garden materials and grant money to purchase plants and soil. The garden materials, which include benches and a gazebo, are made from recycled personal care products collected through the Garnier program. Miranda says she's been interested in recycling ever since she was small. The West Davidson High School grad plans to pursue a doctoral program in neuropsychology or cognitive psychology. WSSU's new garden is one of 12 Garnier Green Gardens throughout the country.